Need to learn a new technology fast? Get skilled up quickly with a book. Redgate Books is a technical publisher specializing in database and programming technologies. Our authors are practitioners at the top of their game who have the urge to share their knowledge and expertise with others. We now publish in all the current reading formats, including PDF, Kindle, and cellulose editions. If a query is performing poorly, and you can't understand why, then that query's execution plan will tell you not only what data set is coming back, but also what SQL Server did, and in what order, to get that data. It will reveal how the data was retrieved, and from which tables and indexes, what types of joins were used, at what point filtering, sorting and aggregation occurred, and a whole lot more. These details will often highlight the likely source of any problem. 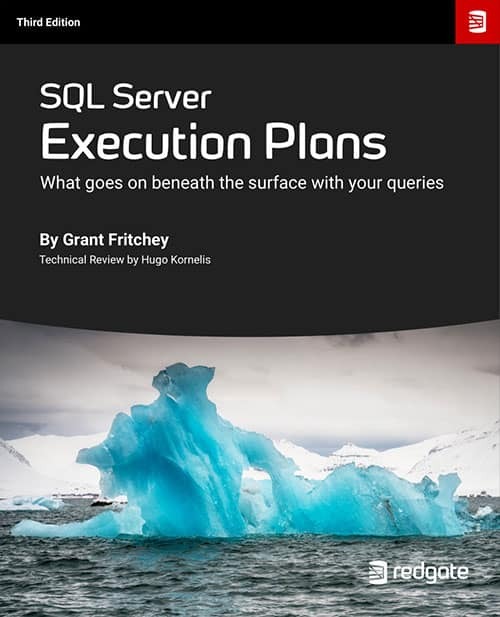 This book has the singular goal of teaching you how to read SQL Server Execution plans, so you can work out the root cause of poor performance and how to fix it. This book shows how to use a mixture of home-grown scripts, native SQL Server tools, and tools from the Redgate SQL Toolbelt, to successfully develop database applications in a team environment, and make database development as similar as possible to "normal" development. 'Defensive Database Programming with SQL Server' should be required reading for all SQL practitioners. When information is exchanged in XML format, you need an agreement between the sender and receiver about the structure and content of the XML document. This "agreement" takes the form of an XSD (XML Schema Definition Language) Schema. Jacob Sebastian's book explains all. Finally a book that can explain the principles of XSD schemas in an easy to understand way. The SQL Server 2016 In-Memory OLTP engine (aka Hekaton) is designed to exploit terabytes of available memory and high numbers of processing cores. It allows us to work with memory-optimized tables and indexes, and natively compiled stored procedures. Hekaton in-memory data is accessible with T-SQL and SSMS, but its internal behavior is different from the standard relational engine. In this book, Kalen Delaney explains how the new In-Memory OLTP engine works, how it stores and manipulates data, and how it can still guarantee the ACID properties of all transactions. 15 first-time authors answer the question: what makes you passionate about working with SQL Server? MidnightDBA and Redgate partnered to produce a book filled with Tribal knowledge on SQL Server. The resulting book is a series of chapters on lessons learned, perhaps the hard way, which you won’t find in traditional training or technical guidance material. As a truly community-driven book, the authors are all generously donating 100% of their royalties to the charity Computers4Africa. Your application can have impeachable indexes and queries, but they won't help you if you can't get to your data because another application has it locked. That's why every DBA and developer must understand SQL Server concurrency and how to troubleshoot excessive blocking or deadlocking. A DBA's tasks, from day-to-day, are rarely constant; with one exception: the need to ensure each and every day that any database in their charge can be restored and recovered, in the event of error of disaster. In this book, you'll discover how to perform each of these backup and restore operations using SQL Server Management Studio (SSMS), basic T-SQL scripts and Redgate's SQL Backup tool. I'm adding it to my list of recommended books for SQL Server DBAs. There's never been a book like this before, and it's a Herculean effort for anyone to pull off alone, and do it accurately. Glenn pulled it off. I highly recommend this book. If you're responsible for maintaining or developing SQL Server systems, you'll find something useful in this book that you can put to work, right away. Brad's Sure Guide to Maintenance Plans shows you how to use the Maintenance Plan Wizard and Designer to configure and schedule eleven core database maintenance tasks, ranging from integrity checks, to database backups, to index reorganizations and rebuilds. This book holds the key to "encryption without fear". In it, John Magnabosco sweeps away some of the misconceptions surrounding SQL Server's encryption technologies, and demonstrates that, when properly planned and implemented, they are an essential tool in the DBA's fight to safeguard sensitive data. Inside the SQL Server Tacklebox you'll find day-to-day tools, scripts and techniques to automate and standardize SQL Server installation, document and report on your servers, migrate data and manage data growth, troubleshoot performance issues, receive notifications of impending issues, secure access to your servers and fight off the data corruption monster. SQL Server Tacklebox is a must have for the technical library of any DBA. A 2nd edition of Brad McGehee's popular "career guide" for DBAs, designed to help new and prospective DBAs find their feet in the profession, and to advise those more-experienced on how they can excel at their jobs, and so become Exceptional DBAs. The book is a quick read, and at the end, I was left re-energized. It had the effect on me of a professional motivational speaker, at a fraction of the price. Whether you're practicing for an exam or interview, or just wanting to see who's got the biggest SQL Server brain in your office, this book is perfect. Containing 100 SQL Server Central Questions of the Day, this book is a great way to test yourself or increase your knowledge. Brad McGehee's "from the ground up" guide to SQL Server's most powerful performance diagnostic tool. In the Complete Guide .NET Performance and Optimization, Paul Glavich and Chris Farrell offer a comprehensive and essential handbook to anybody looking to set up a .NET testing environment and get the best results out of it, or just learn effective techniques for testing and optimizing their .NET applications. Of almost a hundred Simple-Talk articles on topics of interest to System Adminstrators, we've chosen the best and most popular ones for an essential collection that packs a great deal of information about common tasks for the working System Adminstrator. Having worked with Exchange Server for the last 14 years, Jaap's Practical Guide to Exchange Server 2010 draws upon all that experience to deliver an easy-to-use guide to this latest platform, full of useful examples and top tips for SysAdmins, both new and experienced. Mankind would benefit greatly if all technical books were written like this. A truly effective assistant knows their manager’s priorities, concerns and responsibilities as well as they do themselves. They know how to make their manager more effective, and how to help them add value. They work alongside their manager as part of a tight-knit, high-functioning team, sharing a single purpose and workload. Of all teams, of all working relationships, I believe this one has the capacity to be the most transformative for a business. Neil presents an honest, candid picture of the software world and how to work within it. Recommended! The software industry is, just occasionally, more absurd than one would dare to imagine. Having spent most of his working life in its clutches, Phil Factor has pretty much "seen it all" and what's more he's prepared to tell what he knows. The second edition of Phil's "Confessions of an IT Manager" contains Phil's full repertoire of tales of institutional mayhem and software projects gone awry. You won't find a more bitingly funny take on the way the IT industry works. Download your free copy of SQL Code Smells and learn to spot the warning signs in your code.